Alumni are uniquely positioned to help undergraduates understand what it means to become professionals in their chosen fields. Using readily available videoconferencing software is a simple and effective way to bring alumni into your classroom to provide this support. You’ll find that alumni are more than willing, but it takes good planning to make it work particularly well. How can colleges and universities best support undergraduates as they grow into professionals? What is the role of the academic curriculum in student professional development? And how can faculty contribute to these efforts? As a new faculty member with recent job searching experience myself, I have been drawn to such questions as I work with students in lab research and classwork. With students increasingly requiring professional development to be competitive with employers, these questions are not only relevant but essential for the continued success of undergraduate institutions and their graduates in the rapidly evolving 21st century economy. All students need to develop skills to communicate professionally with others in their field, to be able to build professional relationships and contacts based on their work and interests, and to apply their current knowledge to new contexts. To gain these skills, they need input from professionals working in the current economy. However, faculty are often limited in their own experience with these skills; many have exclusively worked in the academy and may not have connections to the diverse professional realms which students will pursue, thereby limiting their personal ability to support student growth in these areas. What would help students are professionals willing to share their experience and support student growth by providing an applied perspective toward future employment. Alumni are uniquely positioned to support undergraduates in this regard; hearing their stories raises student awareness of the process and possibilities that exist beyond college. Alumni bring current perspective and application of student learning into focus, and their dynamic, “right-now” work complements learning the more static background content. I have seen many examples of alumni making students aware for the first time of ways they can use their talents and values in a particular career direction. Alumni are a direct comparison group for students since they have been “in their shoes.” They are a unique voice for students to hear from at this formative time of their lives, and seeing the diversity of career paths taken by alumni can be a powerful learning experience for students wrestling with the uncertainty of career planning. As future employment will require students to be self-directed in their learning and capable of consistently upgrading their skills (Selingo, 2016), interactions with alumni offer first-hand experience with this reality from those who have an understanding of the undergraduate’s context. Importantly, the mutual bond of the undergraduate experience can create a strong innate connection between alumni and students, an unspoken trust that often enables fruitful, honest dialogue from their very first interactions. This connection can enable a highly impactful experience in a single conversation. For these reasons, institutions should view alumni as resources and assets to current students. Finding ways for alumni to engage with students is a win-win situation for all involved, and there is a growing recognition of the importance of seeing alumni-student relationships as long-term opportunities to impact student learning and produce highly favorable outcomes (Gallo, 2013; Singer & Hughey, 2002). In my experiences working with alumni, I have found them to be strongly interested in supporting individual students and generous in their willingness to contribute to the classroom however they can. They understand the importance of professional development from their own experience and are eager to share what they have learned in their career journeys with current students. In this sense, alumni can serve as role models and mentors to current students, and formal programs engaging alumni can be highly successful in enabling student professional development (e.g. Sword, Byrne, Drummond-Young, Harmer, & Rush, 2002). I have tried to incorporate alumni into my coursework in a number of ways, but the most productive activity was alumni videoconferencing, where the class has a conversation with an alum about their professional experience in a STEM field. 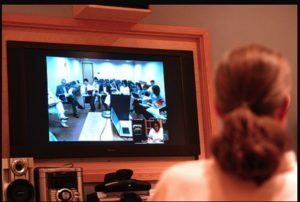 The following section discusses my experience in planning the logistics of alumni videoconferencing for two types of courses, a senior-level neuroscience major seminar (~6 alum discussions/course, ~8-10 students/course) and a general-education non-science major course (3 alum discussions/course, ~30 students/course). To contact alumni appropriate for my course planning, I worked with staff in the Office of Alumni Relations at Oberlin, asking that they email all alumni who fit a given set of criteria. For example, for my neuroscience major senior seminar, I asked them to contact all alumni who majored in neuroscience. For my non-majors science course, I asked that they contact alumni who majored in a subject other than natural sciences but who now work in a science-related professional position. In both cases, my contact email contained a brief introduction, a short description of my course and why I thought alumni-led discussions would be productive, and an invitation for them to contribute to the course. I let them know that their response to the initial email was not a final commitment but only showed an interest on their part in participating. I asked that they respond within 2-3 weeks and asked the alumni office to route any replies to my email. In fact, most who are interested will reply within a few days, but stick to your deadline anyway. For a general structure of the ~45 minute discussion I envisioned, I recommended that half of the session be about career paths and a discussion of some readings recommended by the alumni, and half of the discussion be a Q&A from the students. Over the next few weeks, I would reply immediately to alumni responses, acknowledging that I got their email and letting them know I would follow-up after the deadline with final planning details. After the submission deadline, I reviewed the list of replies and select a set of alumni based on my goals for the course. A number of alumni responded positively for my neuroscience major senior seminar, and I ended up choosing a set of speakers who could represent a broad diversity of career paths with a priority toward including non-academic and non-medical positions when available (e.g. a biotech R&D director, a design consultant, a public health researcher, a disabilities researcher, a science writer, a non-fiction author, a neurosurgeon, and an autism clinical researcher). As it turned out, I actually had enough alumni reply to my initial email to plan unique speakers for each of the two consecutive semesters I was offering the course, and therefore could plan both semesters simultaneously. On the other hand, only a few alumni responded regarding the non-majors science course, and for this reason I included almost all of them in the course. These included a surgeon who was religion major, a state political party chair, and a non-profit executive working on environmental analysis. Once I had selected a preliminary list of speakers, I made a tentative schedule of speakers for the syllabus, attempting to coordinate with other content in the course when possible. I then sent these alumni a second email, formally inviting them to participate in the seminar and having them choose from a set of possible dates. Once I heard from everyone — I had given them two weeks to get back to me — I sent each a final confirmed schedule and indicated that I would check back 2-3 weeks prior to their class session. I also asked them to recommend some readings to enable students to prepare for the discussion. To be sure, all these administrative steps can be tedious, but long-term planning is extremely important for maximizing the success of the activity; I highly recommend creating a calendar of internal deadlines to simplify the process and ensure that scheduling alumni participation will be as easy as possible. The smoother the logistics, the more likely alumni are to participate and the more of an impact the interaction will have on the students. To follow up 2-3 weeks prior to a specific alumni discussion, I emailed the speakers and reminded them to provide 2-3 readings for the students to help them prepare for their discussion. These readings were posted on Blackboard, our content management system, one week prior to the in-class discussion. I also sent detailed instructions on how the alumni would join the discussion via videoconferencing (Oberlin uses Zoom software). Some alumni were kind enough to try the software out with me before the scheduled class. (I also exchanged cell phone numbers to ensure we could communicate on the day of the class, just in case something went wrong.) To encourage student preparation for the discussion, I assigned a pre-class writing requirement. For example, for about half of the alumni discussions in the neuroscience senior seminar, students wrote a short (250 word) analysis of the readings and posted 1-2 questions for the speaker on Blackboard. These posts, which I graded under a participation category, were publicly available to classmates and helped students prepare for the discussion and maximize their time with each alumni guest. Students also knew these pre-class posts would be reviewed by their classmates in preparation for a post-class written response. I held classes for these discussions in rooms specifically designed for videoconferencing (i.e., they had webcams, microphones, and a computer), although one could easily set up a video connection in a traditional classroom without specialized tools, using free software such as Skype and your computer’s own webcam. In any case, one might want to work with IT staff to ensure smooth sailing. Students were strongly encouraged to be early to class to maximize our time with the speaker. Once class began, I briefly introduced the speakers, urging them to give a more thorough introduction themselves, and then turned the session over to the alumni speaker. I limited my own interventions, allowing the guest and the students to direct the discussion. If the Q&A began haltingly or hit a lull, I would encourage students to use their questions from the pre-class writing exercises. But, in general, the discussion flowed naturally; the alumni speakers were thoughtful in sharing, and the students were eager to ask questions. After the video conference session ended, I found students often wanted to continue discussing, so we carried on for another 10-15 minutes. In the larger, non-majors course, the extended discussion took place with 5 or so students talking at their tables for about 5 minutes and then sharing with the whole class. Having the space to think and then talk about the speaker in small groups appeared to add an important reflective component to the experience. In effort to extend the impact of the alumni interactions, I assigned a writing exercise to encourage students to think further about their discussions. For about half of the alumni discussions in the neuroscience senior seminar, students wrote short (250 word) analyses of the alumni-assigned readings and the in-class discussion and also to comment on one pre-class analysis written by a classmate. Students could chose which of the sessions they wanted to write pre-class analyses and post-class responses for, giving them some flexibility depending on their week-to-week schedule. For the non-majors course, students wrote 1+ page entries in their reading journals based on the readings and the in-class discussion. *A senior neuroscience major reported back a year after seminar that talking with alumni who did not pursue MD or PhD training gave them the confidence to explore and pursue other career directions as well; the student was about to enter a physician assistant training program. *A majority of senior neuroscience majors identified alumni videoconferencing as one of their favorite course activities in end-of-semester evaluations. There were also a number of unexpected benefits to these discussion, particularly in terms of bolstering alumni-institution relationships. *One speaker, a neurosurgeon in the Cleveland area, ended up taking students for shadowing and then teaching a clinical neuroanatomy course on campus in a subsequent semester; he was grateful to reconnect with Oberlin, and my department was thrilled with his contributions. *An alumni who is now a science writer in Washington DC reported that the Oberlin coffee mug I sent as a gift for participating has became a conversation starter with other alumni at local coffee shops. *One alumni mentioned that engaging with current students felt like a major milestone in their Oberlin education. For me, having alumni bring in current content and lead class sessions gave me more flexibility in course planning and provided a unique perspective on STEM-related opportunities for students in the professional realm. While I started these activities for the benefit of the students, the alumni and the institution (as well as the instructor!) appear to have gained significant value from these interactions as well. And there may be additional benefits to student-alumni interactions in the classroom in addition to career development. Research in student success and persistence in STEM fields has noted strong links to student motivation and identity development (Cromley, Perez, & Kaplan, 2016; Shin, Levy, & London, 2016) and to the relevance and transferability of what is studied to the lives of students beyond the classroom (Hulleman & Harackiewicz, 2009). Given the positive influence of an instructor’s race and gender on students’ persistence in STEM fields (Price, 2010), interacting with someone like oneself engaged in a scientific career may increase student engagement with STEM and a greater appreciation of their own potential in science-related careers. In my example, interacting with alumni speakers of different gender, racial, and socioeconomic identities enabled my students to connect with more diverse role models than I could provide by myself. Alumni engagement can thus directly contribute to diversity, equity, and inclusion efforts. In summary, engaging alumni in the classroom can be a rich learning experience for students in furthering their professional identity. The specific activity of alumni videoconferencing requires an investment in relationship-building and commitment to student professional development, but the outcomes I have seen are certainly worth that and more. I will continue to look for ways to leverage alumni experiences in the classroom and look forward to working with students, alumni, and colleagues to support student development as young professionals. Cromley, J. G., Perez, T., & Kaplan, A. (2016). Undergraduate STEM achievement and retention: Cognitive, motivational, and institutional factors and solutions. Policy Insights from the Behavioral and Brain Sciences, 3(1), 4-11. Gallo, M. L. (2013). Higher education over a lifespan: A gown to grave assessment of a lifelong relationship between universities and their graduates. Studies in Higher Education, 38(8), 1150-1161. Price, J. (2010). The effect of instructor race and gender on student persistence in STEM fields. Economics of Education Review, 29(6), 901-910. Shin, J. E. L., Levy, S. R., & London, B. (2016). Effects of role model exposure on STEM and non‐STEM student engagement. Journal of Applied Social Psychology, 46(7), 410-427. Singer, T. S., & Hughey, A. W. (2002). The role of the alumni association in student life. New Directions for Student Services, 2002(100), 51-68. Sword, W., Byrne, C., Drummond-Young, M., Harmer, M., & Rush, J. (2002). Nursing alumni as student mentors: Nurturing professional growth. Nurse Education Today, 22(5), 427-432. Young, J. R. (2016). Reinventing the career center. The Chronicle of Higher Education, Oct. 23, 2016.